Inside Halliwell Manor from the TV Show "Charmed"
This painted Victorian is instantly recognizable to most of us as Halliwell Manor from the popular TV series “Charmed.” The show was set in San Francisco, but in real life it’s known as the Innes House in Los Angeles. Take a look! Update: You can see the house from the new “Charmed” reboot, which is pretty fabulous, too, here. I’ve probably gotten more requests over the years to feature this house than just about any other. The problem was that I had never seen a single episode of the show and didn’t know anything about it. It takes awhile to catch up on 8 seasons and gather photos and screenshots. I think I’ve been working on this post off and on for at least 3 years. Maybe 4! Only the exterior of the real house was used for filming. The interiors were all sets created on a separate soundstage. At the beginning of the series, Shannen Doherty played Prue, the oldest Halliwell sister, but she was killed off in the third season finale. Rumor has it that she left because she didn’t get along with Alyssa Milano, who played her younger sister Phoebe. The drama came up again last year in an interview with Milano, who hinted that they didn’t always get along. 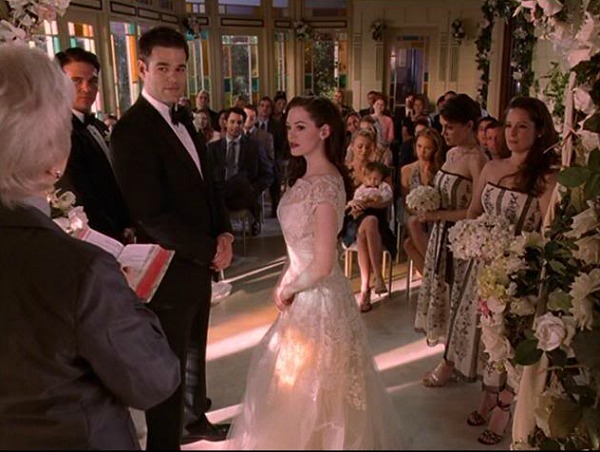 In any case, when the series returned for a 4th season, Prue was dead, and they discovered they had a new (half) sister they’d never heard of before — Rose McGowan’s Paige. Kaley Cuoco, who plays Penny on The Big Bang Theory, was on Charmed for one season as Billie Jenkins. A reader named Kellie sent me lots of information about the show and the house. 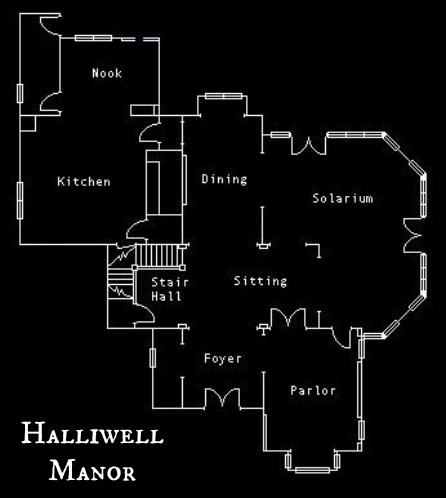 She told me, “Halliwell Manor is built on top of what is called a Spiritual Nexus. A Spiritual Nexus is a point that is equidistant from the five elements: fire, water, earth, wood, and metal. When connected, the lines make a pentagram, which is supposed to be a Wiccan sign. Alyssa Milano later starred on the TV show Mistresses, which featured some pretty great sets of its own. I found a couple of old photos of the house floating around the Internet. 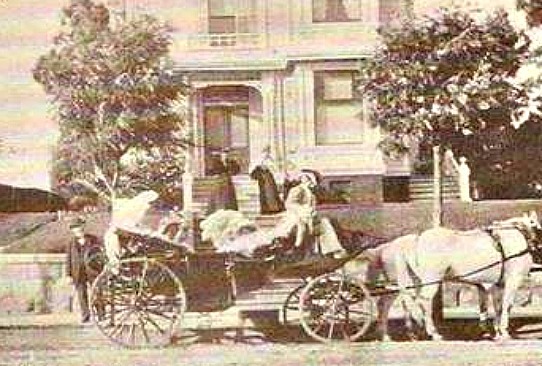 The Innes House was reportedly built in 1887 for one of LA’s first City Councilmen, Daniel Innes. in Angelino Heights, one of the oldest neighborhoods in L.A.
It’s considered an Eastlake Victorian. The listing says the house has 5 bedrooms, 1 bath, and 2,900 square feet. It was on the market in 2008 for about $700,000 but the listing was removed later that year. I also came across a photo of the house that faces it across the street, which is shown in several episodes of the show. 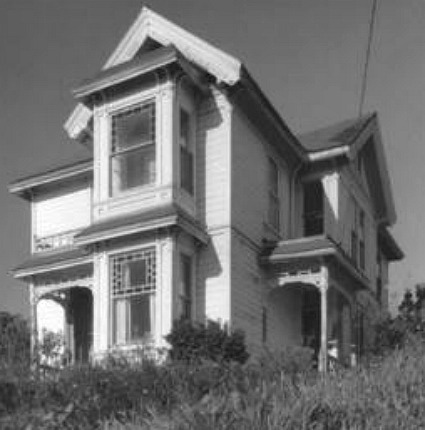 Some of the best photos I found of the house (and the street) were on the Midnight in the Garden of Evil blog. Visit that page to see more photos and learn more about the history of the neighborhood, including how Michael Jackson’s Thriller video was filmed nearby. I took some of these screenshots while watching the show but also found photos on the Charmed Wiki page, a Charmed Angel Fire page, and the Midnight in the Garden of Evil blog. Thanks also to Kellie, who not only gave me information about the house but sent quite a few pictures of it, too. The Cherry Street Inn from the Movie "Groundhog Day"
The show started in the 1990s, so I think the decorating looked a little less old-fashioned at the time than it does to us now. And it was supposed to have been in the family for generations, as Alie mentions below. But you wouldn’t know three women in their 20s lived there at first glance, for sure! “popping in” – Demons were always “popping in” not pooping. Sheesh. Hi, I love Hooked on Houses! 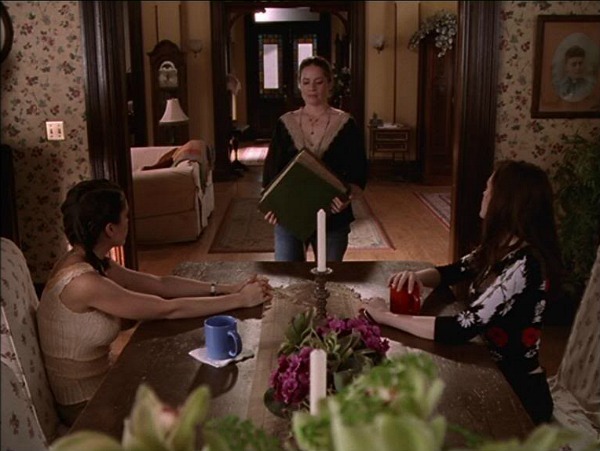 Towards the end of the series of Charmed, Phoebe had an apartment that was wonderful. Is there any chance of pictures ? I love the real home exterior of this place! They did a great job on the interior sets as well. You’re right, Julia, the décor does seem an odd choice for young women, but since the home is supposed to have been in their family for generations, I can see tradition winning out over trend. It gives an impression of establishment and comfort; sort of like a trip to Grandma’s. Reminds me a lot of Sookie Stackhouse’s gran’s house in True Blood. That’s another good one! Thanks, Alie. Thanks for this. I LOVED charmed. I didnt watchas much after prud died, and addding the Billie character was crazy. Did you binge watch(as 8yr is alot to go thru) a season or just watch as you could. Lastly,in the 6th picture after pic of Paige’s wedding of the street,is the brown house to right of the innes house burned? It looks so dull. I watched episodes as I could on my computer and took screenshots as I went along over the last few years. (I forgot to mention that Netflix is still streaming the series if anyone wants to check it out.) Fun show! I don’t know what the deal is with that house next door but it looks like it’s in bad shape, doesn’t it? that dull brown house was where dan lived in the charmed series, and it looks like the house that paige got spooked by. it ended up being a place with a man made boy and a monster who shrinks girls and turns them into one of a kind ciramic or clay sculptures. i hope that answers your question, if you have anymore charmed questions, i would love to answer them, i am a HUGE fan, i wish i was on that tour… thnx bye!!! & continuing for a few past that. Oh, wow! Those photos are amazing. I just updated my post. Thanks so much, Ash! No problem! Thank YOU for all the hard work in this post! Thanks, Ash! I really enjoyed looking at the real Innes House interior! 🙂 It looks to me like they used the real home as an inspiration for the show sets. The woodworking looks pretty similar, but the designers did their own thing with the décor. 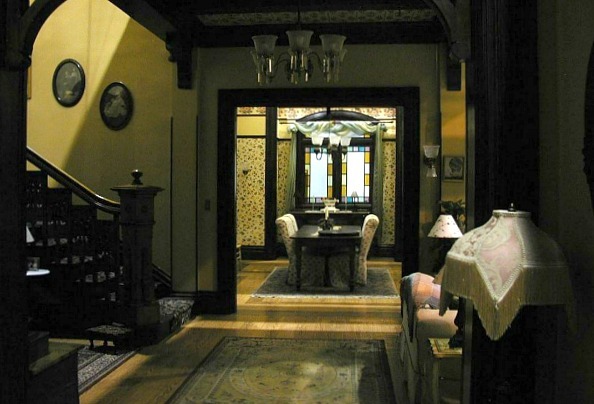 I remember hearing that the pilot episode was filmed in the actual house and that they created the sets, after the show got picked up, to be as true to the house’s interiors as possible (particularly the staircase which was featured several times in the very first episode). yes, that was written about the sets back in the ’90s. they recreated the house on a soundstage after the pilot. This is one of my favorite shows EVER and I am so happy you featured the house!! My girls and I are Charmed fanatics and I always loved the house and have been waiting for you to feature it – ha! 🙂 Beautiful job! Wow Julia, you do work hard for us and it is appreciated! I did not watch the show and this is not my favorite style house, but I really enjoyed reading today. Again thanks for all you do! I’ve always loved Charmed. You can catch it in reruns in the mornings on TNT and in the afternoons on Lifetime (in NJ it’s on 7-9am on TNT and 3-5pm on Lifetime.) It was such a lovely surprise to see this post today. The girls lived with their Grams (Grandmother) and then she passed away before their powers were returned to them. Grams bound their powers as young children to allow them normal childhoods. I like to think they kept the house as if she still were alive to keep her close to them. (and she did appear in many episodes as a ghost or spirit). It was their ancestral home – maybe they didn’t feel modernizing it was their right? Thanks for this feature! I loved the Charmed house. Yes, it was old-fashioned for such young women. However, the characters were written as girls who honored their ancestry, so it fit that they didn’t change it. charmed, in re-runs, used to one of my guilty pleasures, the house was one of the reasons i watched it! it was old fashioned, but very in keeping with the tone of the show. 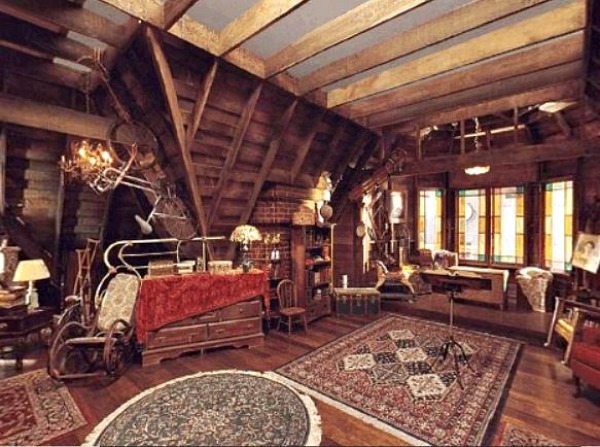 somewhat reminded me of the practical magic house. 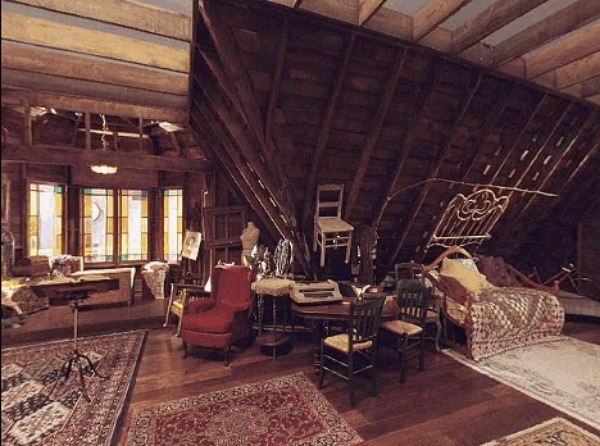 the attic was my favorite. i love the house in the witches of east end, especially the kitchen. hope you’ll do a feature on it sometime. thanks for all of the work on this post! If I get enough requests for “Witches of East End” I’ll definitely start working on a post about it. I love that one — the kitchen is my favorite room in their house, too. Thanks, Nanne! I never watched this show, but guess they avoided showing the right side, which doesn’t seem to actually have a solarium protruding there. I love solariums like that, though. The only house on a witch show I’ve taken much interest in lately is the one on American Horror Story: Coven, which was a gorgeous New Orleans mansion. You’d love the house, Julia, but the show might be a bit beyond your grossness threshold. Yeah, I watched the first season of AHS and it kinda freaked me out. I’m a total wuss about stuff like that! But I keep hearing about the Coven house, so I might have to watch enough to at least check that out. Ha. Thanks, Wade. I’ve always adored this house. You’re soooo right, witches do have the best cool old houses. I went gaga over the Witches of East End house too. 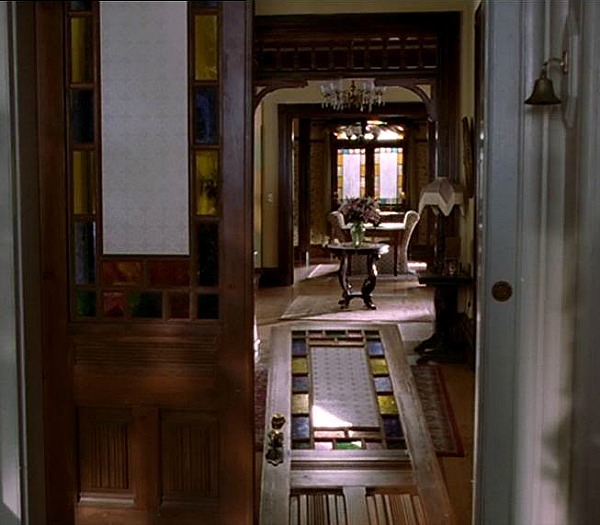 I’ve been at fan of Charmed from the start and have always loved this house. I agree, witches live in the best houses! I think it’s why I love shows and movies about them. The Practical Magic house is my favorite and I also love the house from the series Sabrina the Teenage Witch. Oh and yes, I’m drooling over the Witches of East End house. Gotta love those witchy victorians! Thanks so much for featuring the Halliwell Mansion. I just noticed, when I went to pull up the house on Google Maps, it looks like they were shooting for a movie when the Google car drove by. There were rigs, police and a luxury bus along the street. Perhaps they were actively shooting for Guilt Trip? I love your site but had always wondered why you hadn’t done this house. One of the many shows I watched only for the set. I loved the old fashion decoration of the manor. The kitchen is still one of my inspiration and my readers did laugh when I told them the sisters have two range stoves, one of which, the one on the table/island seems to be in no way connected to gas! I love the look of this house. I also remember every scene of the pictures you took. I love the look of that house it is so beautiful on the inside and outside. Wonderful post — I too was a fan of the show. In the early seasons of the show they often had C-stories related to the problems of upkeep in a historic home on their limited budget–the electric, the fireplaces. I appreciated that as 2 of the 3 were frequently unemployed. i stayed with the show for it’s entire run, so i’m gonna bore you stiff: the sisters p are a predestined trio known as ‘the charmed ones’ who were born to wipe out the source of all evil and restore a certain balance to the world. being descended of a centuries-long line of witches, the difference between the sisters and their ancestors is that rather than having the three powers – telekinesis, psychic vision and the ability stop time (freeze atoms on a localized scale) – each sister would have only one power and be exponentially stronger than they forebears in their designated gift. thus, prudence was telekinetic, piper could freeze motion and phoebe could see flashes of the future. in time each sister’s power would expand and develop secondary characteristics (i.e. piper could also speed up atoms, phoebe could levitate). the carpenter who eventually marries piper is actually their guardian angel, leo, who died in ww2. i have never understood how a man who’s mortal life was over could marry and father children. even with a witch. long-lost sister paige was also sired by their mother’s guardian angel, giving her the power to move objects through a sort of translocation the way leo can move from place to place. this allows her to fill prue’s role as the “telekinetic” of the trio. eventually, paige grows to be able to travel this way. along with the destiny to take down the source of all evil (an actual person first portrayed as an underworld figure cloaked in a scarlet robe with scarlet wings, and then later as a monstrous freak of a demon), the girls must protect their family book of spells – which all demons want. almost any spell, potion or charm they need has been created and written down by their forebears. the girls do learn to write their own spells too. and then there’s a whole thing about how a time travel incident shunted their destinies so that piper’s first born is a near omnipotent creature of terrifying power. Hi Julia! I’m also hooked on houses and I’ve been a fan of your blog for years, but I’ve never thought about commenting until now – when I saw my floorplan for the Charmed house in your post! I fell in love with the show and the house back when I was a teenager. I ran a fan site for it that is now lost to the ether (probably for the best), but it’s fun to see the floorplan I drew up still floating around the internet today. Another commenter here got it right when they said that the pilot was filmed in the real house, which doesn’t match the set they later built. Even though they never filmed inside the real house again, a part of it can actually be seen in almost every episode! 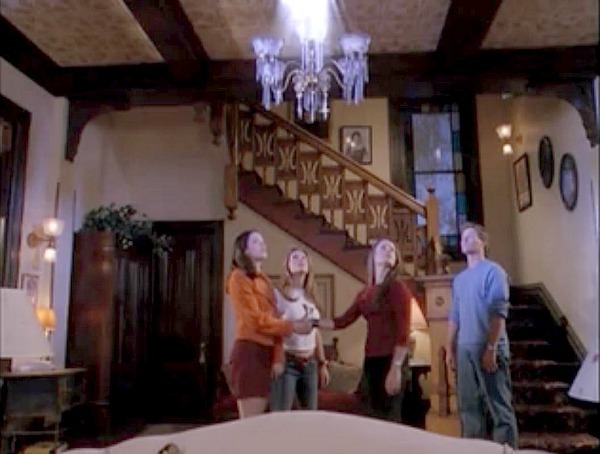 The opening credits feature a clip of a mysterious blue light shooting out of a chandelier, but it’s footage from the original unaired pilot – you can tell because there’s a beautiful corner fireplace visible that doesn’t exist in any of the rooms on the set. I’m not sure how many people watching ever notice that. Again, love your blog, and this is a great post as usual. I look forward to many more to come! Hi Ted! You’re the one who created the floorplan? I’m so glad to know who to thank for that. I was so excited to find it when I was researching the post. It’s helpful to see how all the rooms go together. Thanks for the additional info, too. Great to hear from you!! Loved this show! It’s such a gorgeous house, and maybe it isn’t the most beautiful interior I’ve ever seen, but there’s just something about it that makes it feel so “homey”. Am I the only one, though, that’s always wondered why they have a proper cooker AND a set of, what d’you call it in America, an extra stovetop on the kitchen isle? Why?? On another note, the interior, and the house itself, from the Scottish tv series Monarch of the Glen is aboslutely amazing. A bit run down and not the flashiest of homes, but it’s so cozy and also very “homey” – so you should give it a look. I’ve been watching “Monarch of the Glen” on Netflix. That’s another good one! Thanks, Stella. The photo of the stairs isn’t from Halliwell Manor. 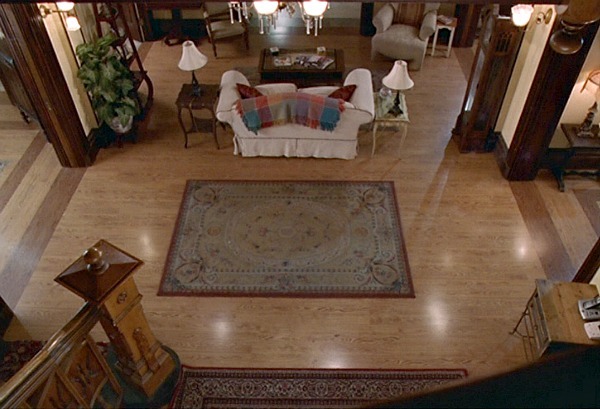 It looks similar, but the wallpaper is different, the doorway to the left of the staircase (coming down the stairs) doesn’t have an actual door in the show – in this picture you can see a bit of a dark wood door – and there isn’t a space beneath the stairs in the show. It’s a flat wall. Oh, interesting. Maybe that’s why I couldn’t track the photo down! Thanks, Meg. My suspessions were confirmed when looking at pic from other site. Dan lived on.other side of manor. I’ve seen this show 3 or 4 times, it’s one of my favorites tv shows ever made, and last time i even thought about taking screenshots. I have hundreds of them, especially of the sets and decor. I can’t quite get a good ideea of the upstairs plans though. The house is supposed to be an old victorian house inherited from their grandmother, that’s why it is decorated that way. 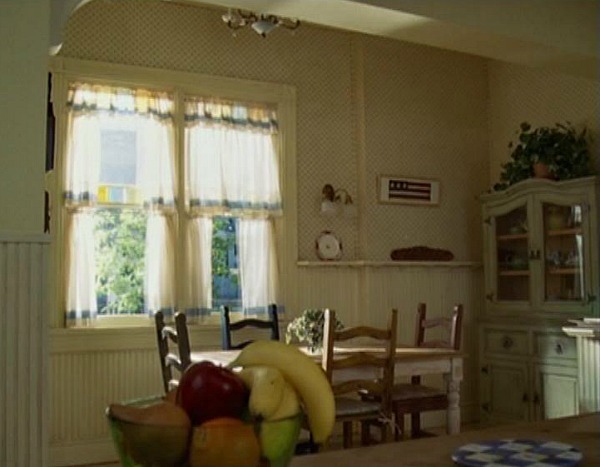 The show started in 1998 and there is an unaired pilot episode that was actually filmed in the real Innes house, so they kind of got the decorating ideas from there. I have sceenshots from that too. It is kind of old looking, but i do like some parts: the conservatory and the kitchen are my favorites. One day, when i’ll have my own house that i hope i will get to build from scratch, i will definitely have a sunroom :D. I got inspired by this show ever since i first saw it. 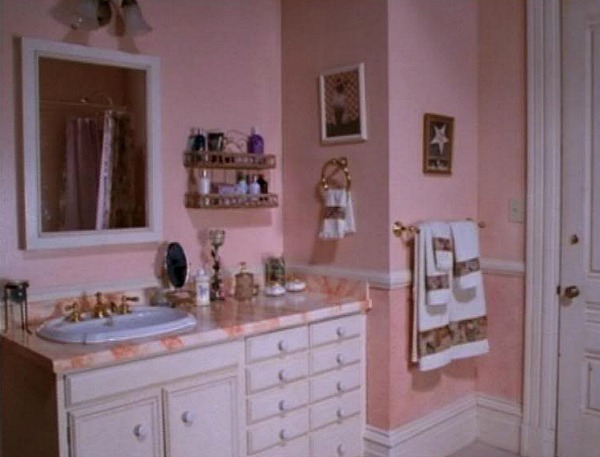 You sould also feature the Sabrina, the teenage witch houses. Also victorian and interesting to see. I could help with screenshots, maybe by the end of this year. Hi you can still your the neighborhood & the house the 1st sat of every month, you go thru a few houses on the tour with the charmed house being the last one, you only go thru the 1st floor it is really cheap i think $10 per person and the guides are awesome look at all the pictures what are missing power lines, they are all under ground, if u are a charmed fan do the tour ! Thanks, Rae! I’d love to take the tour someday. I loved this show and have always been fascinated with the Manor. TNT is airing the series, still in Season 1. I’m enjoying it all over again.. Great job on this site! You did a fantastic job considering you didn’t watch the show. 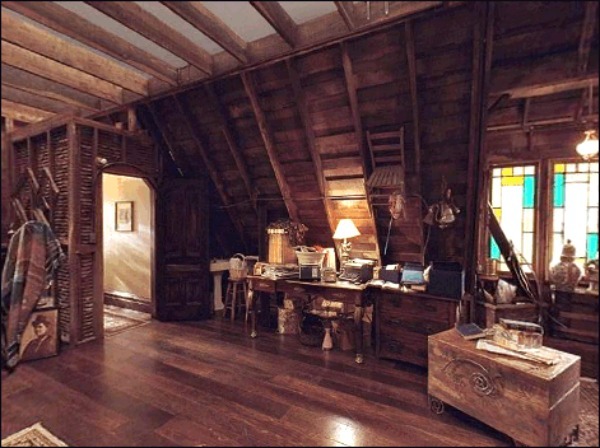 If you watch the show look at the windows in the attic they do not match what is going on with the outside. Love your article.